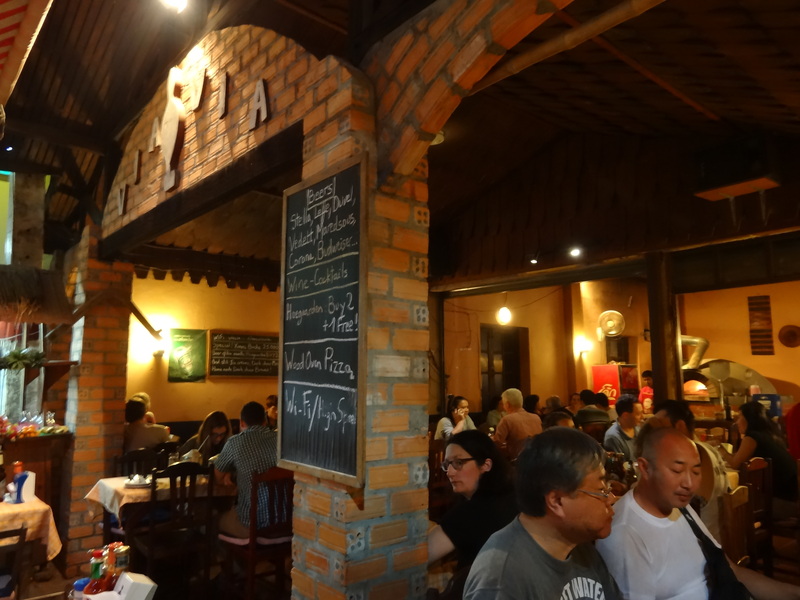 Almost as soon as I started my journey from Singapore to Malaysia, I knew my two day stay in Kuala Lumpur would be full of interesting surprises and unexpected turns along the way. It all started when I made my way to Woodlands train station, located in northern Singapore, to board my overnight train to Kuala Lumpur. For starters, this train station could have been one of the most poorly designed and signed stations into which I have ever gone. There are several different busses and trains that depart from Singapore for Malaysia and the busses and trains have their own immigration checkpoints and checkin procedures. If only it was labeled as such. I arrived at the station two hours before my scheduled departure to ensure everything went off without a hitch, and, boy, am I glad I did. I walked through a long, cold, Soviet-looking corridor through the terminal and up to a set of immigration gates. What had been a cursory process in Singapore, Thailand, and all other destinations up to this point on my trip suddenly hit a snag when the immigration officer told me that i was at the bus terminal instead of the train terminal. Other immigration officers came and escorted me into a quarantine area as they ran all my documents before personally escorting me back to the immigration check at the train station. Following a lengthy wait, I was stamped out of Singapore and awaited my entry stamps for Malaysia at jointly operated checkpoint. I had heard stories about folks who had gone to Israel that had faced hassles entering Malaysia and were even denied entry, so I was a bit antsy given I had been to Israel in January. Certainly the border agents would not know as I had no entry or exit stamp, but that crossed my mind. I faced a lengthy series of questions as they scrupulously flipped through my passport before stamping my passport. I lain in my bed for the overnight train when I heard two fellows speaking English in the cots near me so I struck up conversation and who knew? 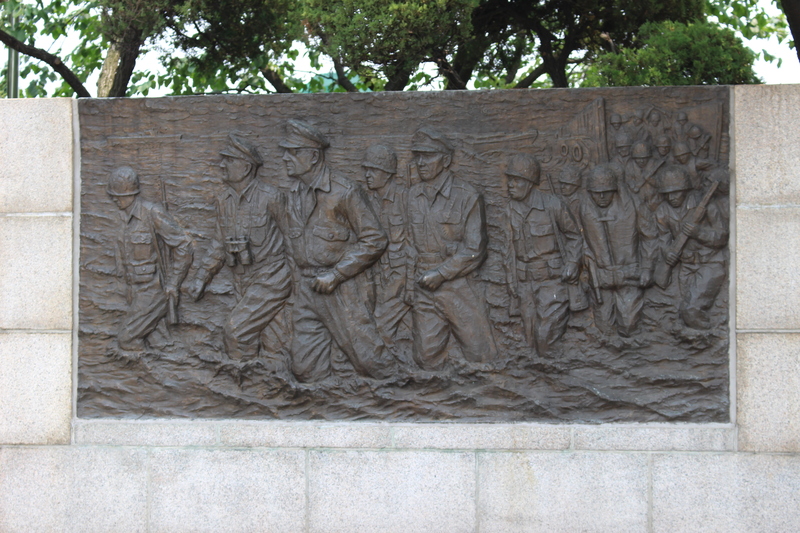 They were also Americans working in Japan. We had a great chat and plan to rendezvous at some point in the future. Eight hours later, my train rolled into Kuala Lumpur’s Sentral Station and when I disembarked I knew I was in a completely different world. Many different sights surrounded me in the train station: women bustling in every which way wearing burkas, Muslim prayer rooms, and signs written in Malay. Given this was my first time in the Muslim world, I should have expected that, but it still took me a bit off guard. Following a quick coffee, I was on my way to my hostel in Central KL when I ran into something oddly familiar- a Girl’s Generation (Korean pop music group) ad in the station. As someone interested in the British Empire and European influence in Asia, I was very excited to see Malaysia and Kuala Lumpur. 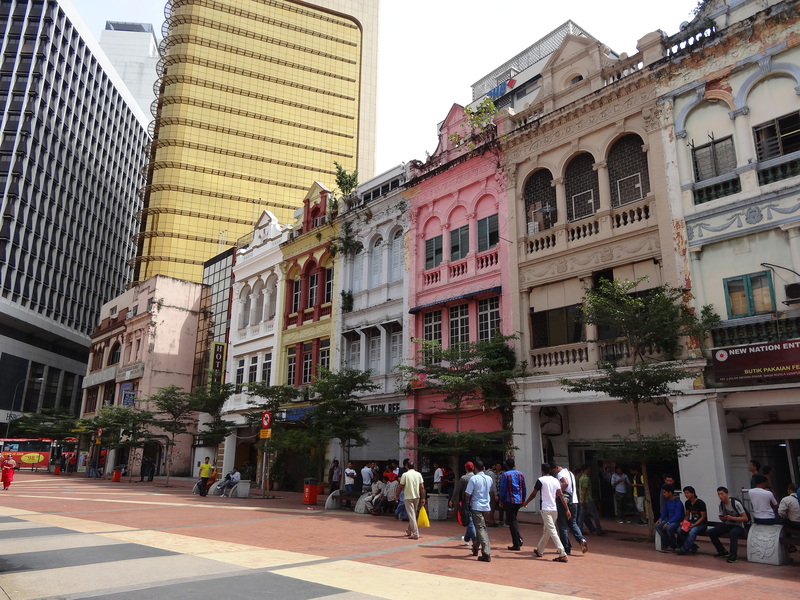 I had heard stories from my Malaysian friends and friends who had visited that Kuala Lumpur is a bustling metropolis where dilapidated colonial-era buildings stand side-by-side with the well preserved buildings and new buildings towering over them. I was in for a treat as soon as I stepped out of the station near my hostel. 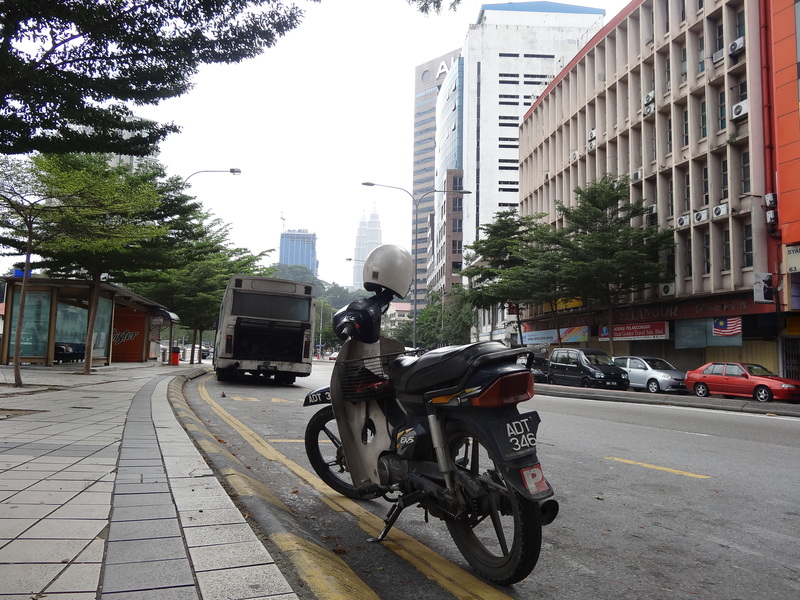 In front of me were various types of colonial buildings and newer hotels/apartments, but this motorcycle stuck out to me, especially as the Petronas Towers loomed large in the background. From here, I went to my hostel, checked in, charged up my camera and phone, and took a short nap on account of the fact that it was extremely difficult to sleep on that overnight train. 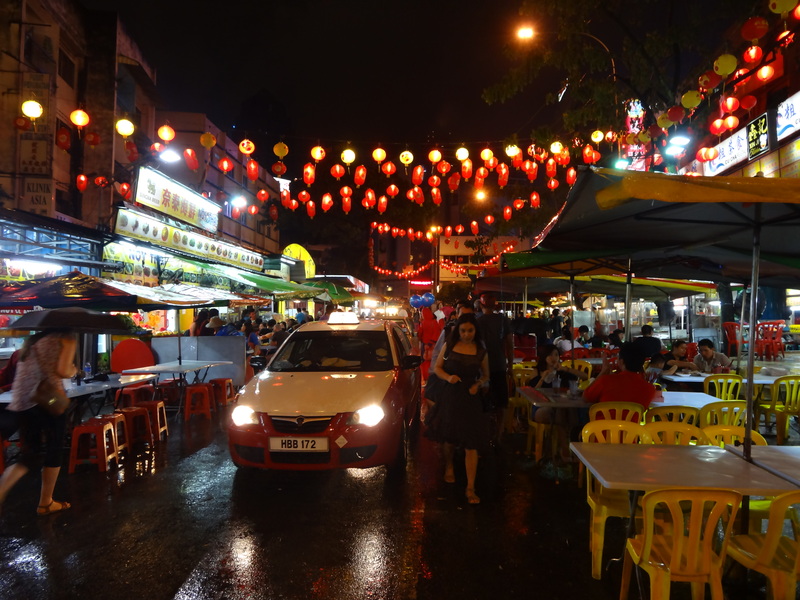 The second day of my trip was already fully booked with a tour of the Batu Caves and some other areas in KL, so I set out on foot to explore a swath of the area near my hostel: Chinatown, Little India, Merdeka Square, etc. were all within walking distance. First up for me was the Sultan Abdul Samad Building. As the power center of British Malay, this elaborately constructed building certainly has stood the test of time. 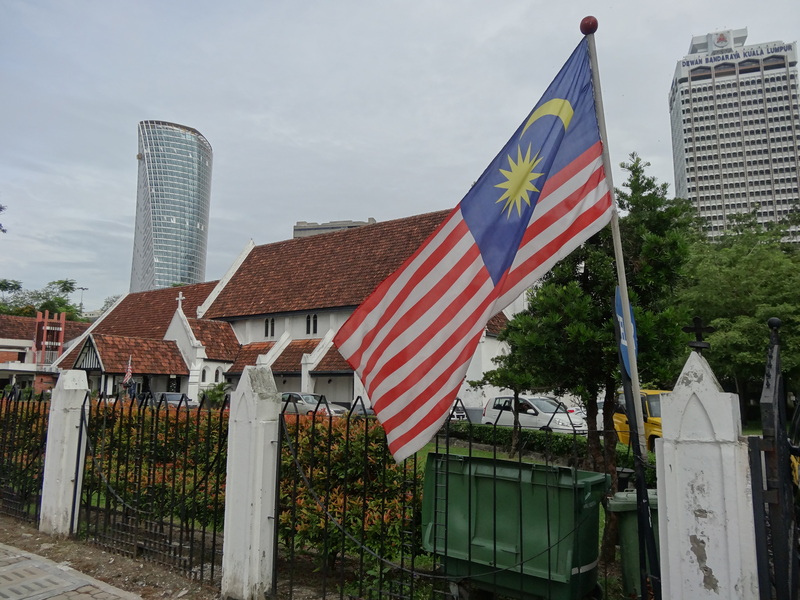 Unlike in other colonies, the British incorporated local and Muslim architectural elements into what would be the center of their operations in Malaysia for many decades. The domes, clock tower, and facade make for an interesting appearance which both stands out and fits in with the surrounding area. One of the most interesting pieces of art nearby is the Queen Victoria fountain, brought from England in 1898 to commemorate Victoria’s rule and British influence in Malaysia. 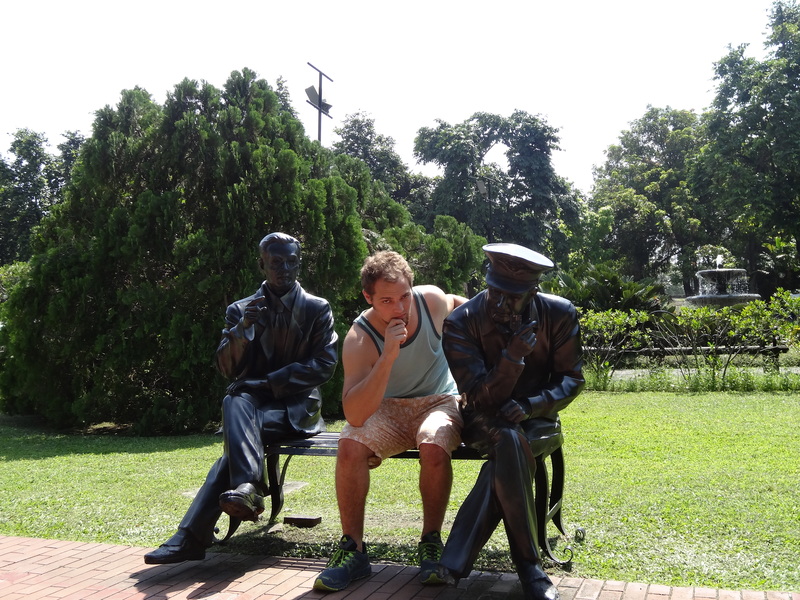 Below is a photo of both of them in Merdeka Square. Aside from this building, several other interesting buildings surround the square. An Anglican Church and former private British club flank the other sides of the square, which used to be a cricket ground. Certainly a must-see place if you are in Kuala Lumpur. 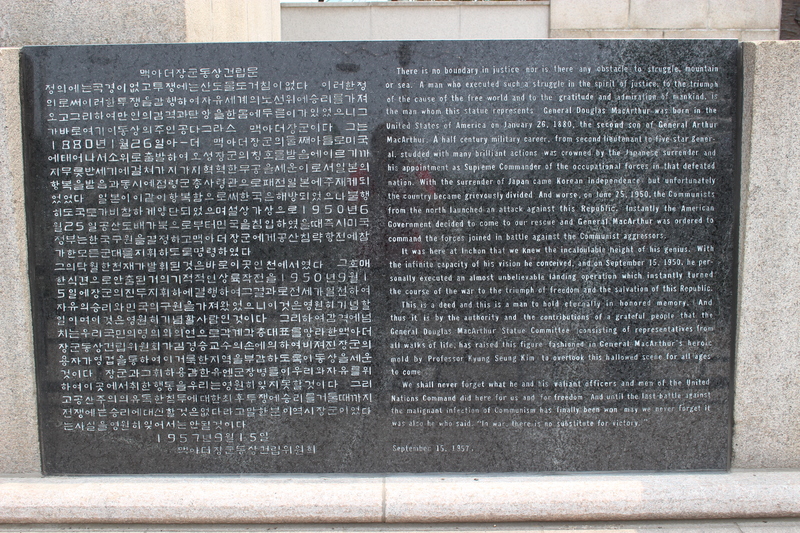 The other element of the square which I found fascinating was the enormous flagpole. I have always been fascinated with flags, and this is certainly the largest flagpole I have ever seen in my life. Eerily similar to the United States flag (and the British East India Company flag), I took a double take when I arrived in Merdeka Square. 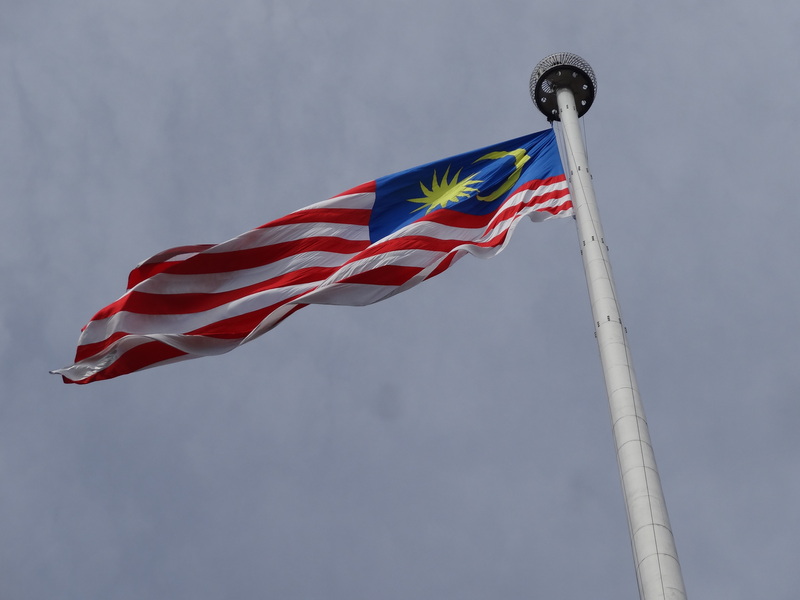 The dominating presence of the flag speaks for itself as a symbol of Malaysian pride. From here, it was off to see some colonial architecture and visit Chinatown before a trip to the Petronas Towers in the evening. On my way to Chinatown, I encountered some of the dilapidated and gorgeous colonial-era buildings about which my friends told me! It was truly a sight to behold. The chipping pastel paint brushing up against street signs and traffic lights is a scene that will not leave my mind when I think of Malaysia and walking the streets of Kuala Lumpur. Then I stumbled upon the Malaysian Heritage Trail and saw some more beautiful colonial-era buildings which had been converted into shops, restaurants, and other places of business. 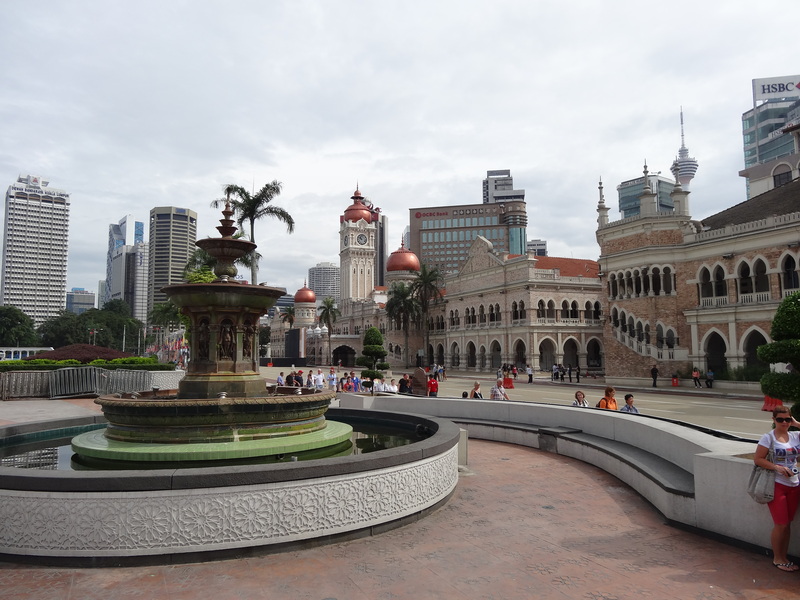 It was another beautiful scene which shows off the history and richness of Kuala Lumpur. Chinatown was a whole different animal. With bustling markets and the smell of street food percolating through the air, I don’t know how anyone could not enjoy a stroll down its narrow streets. That is, of course, so long as cars were not trying to make it down the alleys as well. 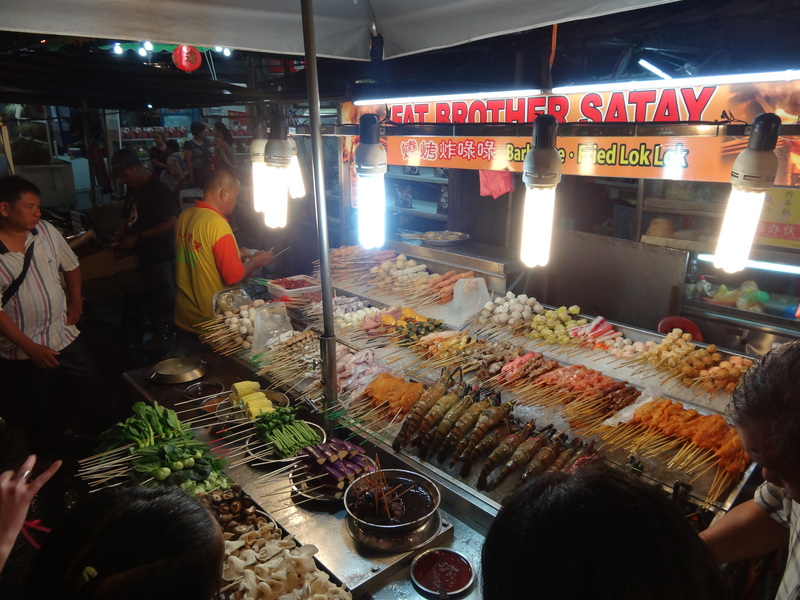 I encountered never before seen foods and shared some delicious chicken at a street side market with a fellow traveler before eventually returning to my hostel to change and head out into the Malaysian night. 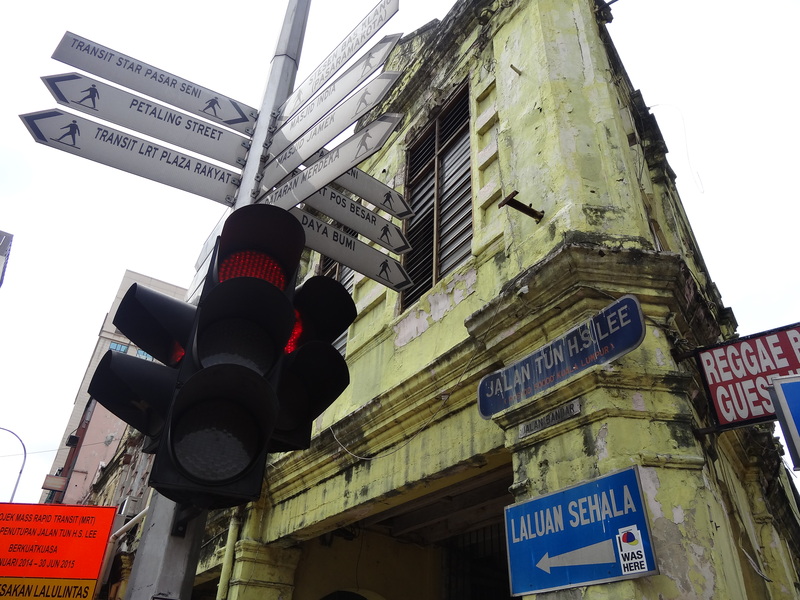 If you ever go to this part of Kuala Lumpur, I am sure you will notice what I did at this point of my journey: the streets are higher than the sidewalks at certain points in the city! 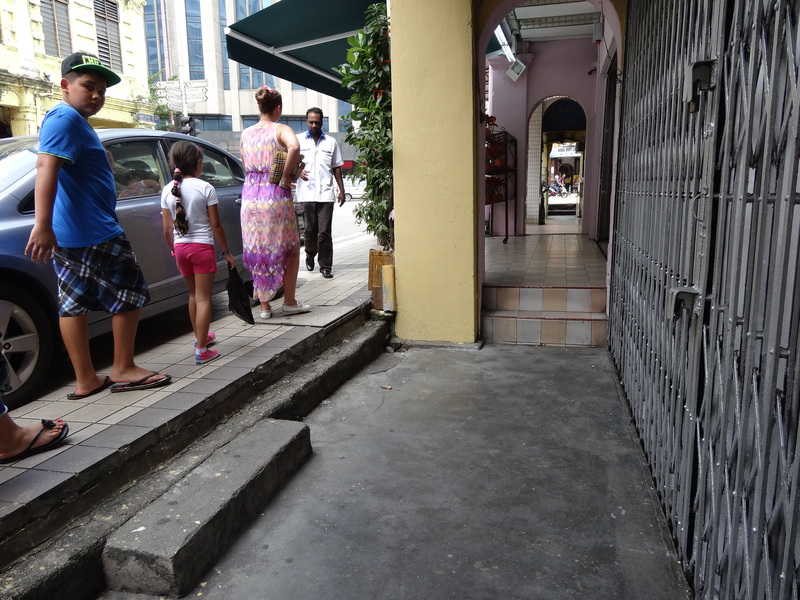 I could not figure out what was so peculiar about the streets until I tripped up the stairs when leaving a shop. Years of new pavement, sewage systems, and electrical utilities are certainly the cause of this. Here’s a look. I could not wait to see the Petronas Towers in person and the two skyscrapers did not disappoint. I arrived at twilight and was fortunate enough to see the lights turn on from below. The glistening eight-sided spires connected by the skywalk was certainly a sight to behold for all. Add into the mix the luxury malls beneath both towers and I could see why people would come to these towers for a day out on the town. As I mentioned in an earlier post, one of the interesting people I met in Singapore was in Kuala Lumpur not his evening as well. 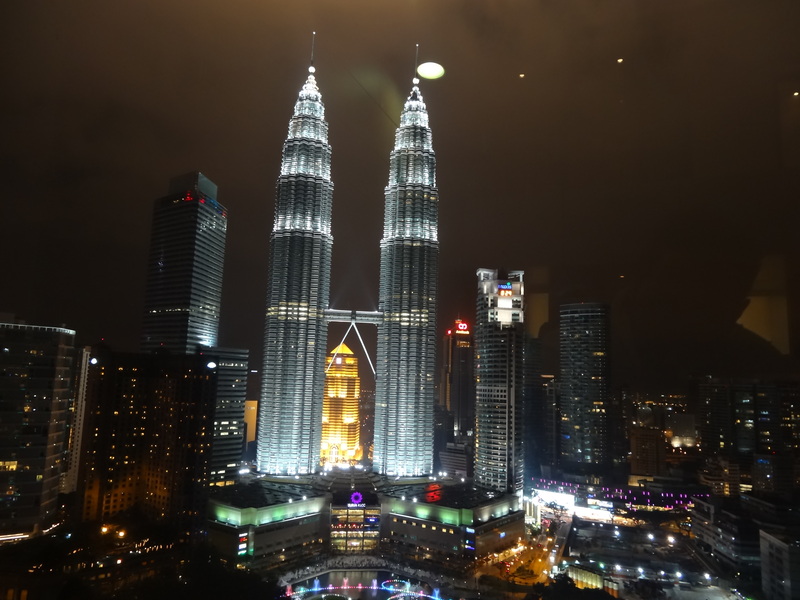 My new Korean friend and I rendezvoused at the fabulous SkyBar inside Traders Hotel to have a drink and take in the breathtaking view of the Petronas Towers from 33 Floors above Kuala Lumpur. 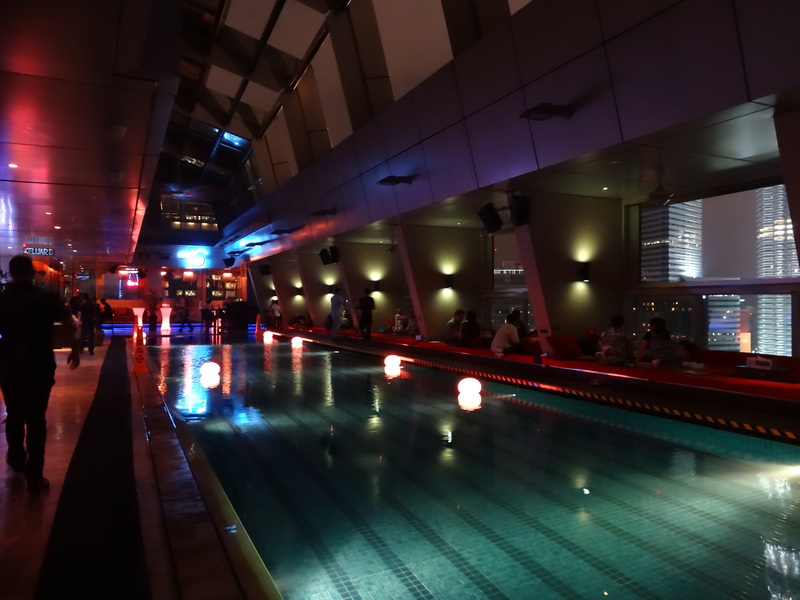 I usually am not keen on spending big bucks for a drink, but if you love cityscapes, skylines, or just breathtaking views, you MUST go to SkyBar. Add into the mix that there is a pool inside the bar and I don’t know how you cannot go. I was very happy to meet up with my friend and discuss Kuala Lumpur, Singapore, and other travel destinations in such an unlikely place. 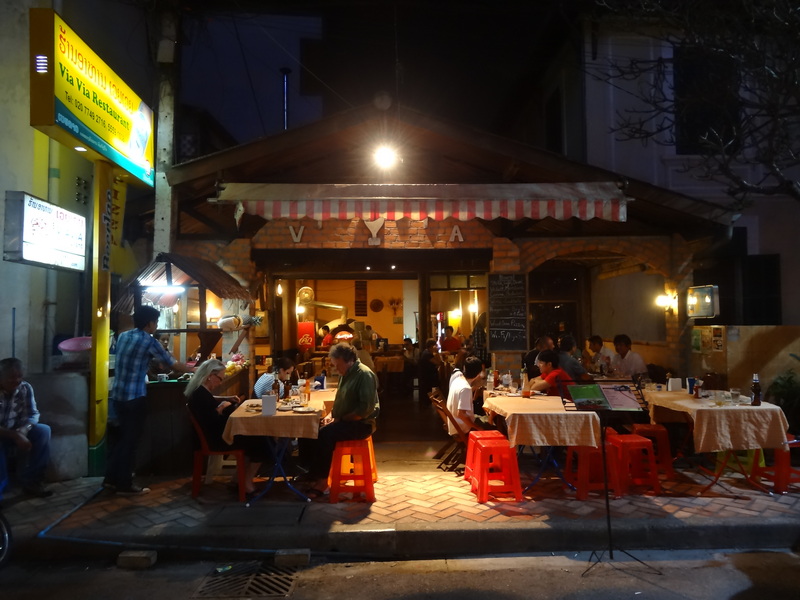 As the rain began to fall for the first time on my trip, we decided to head to the streets to feast on the cheap street food that is omnipresent in the city. 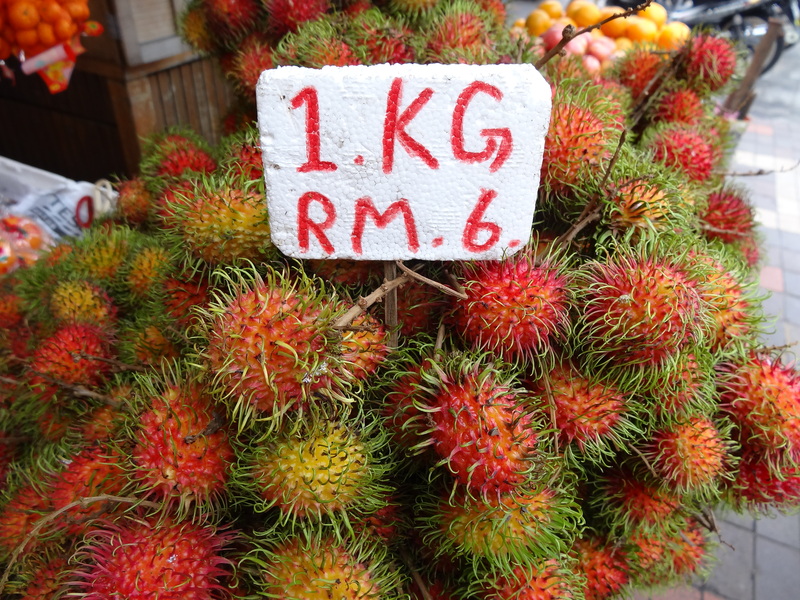 Once we arrived at Jalan Petaling Market, we were very pleased. Delicious street food was everywhere for the taking. 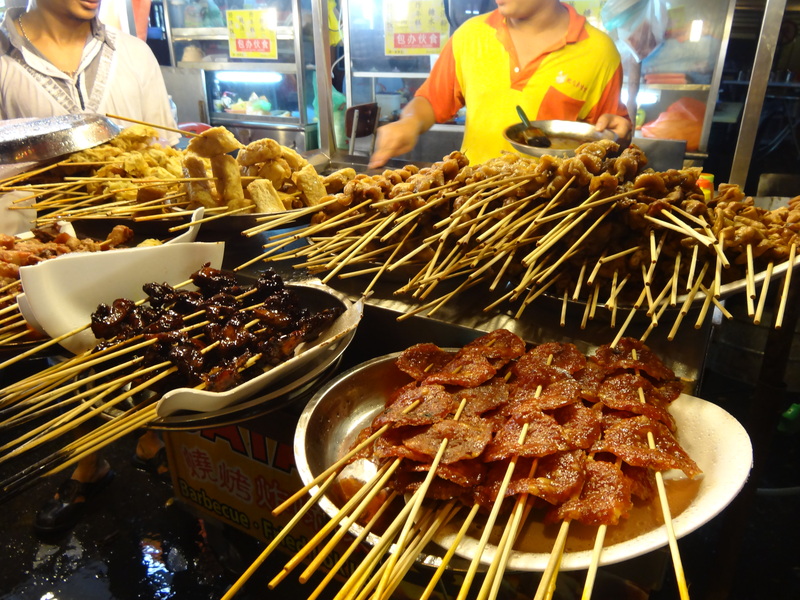 I enjoyed an entire deep fried frog and some other delicacies on a stick and she had various other types of local fare. The gentlemen running all of the stands were very nice and helpful when it came to suggesting what to eat. 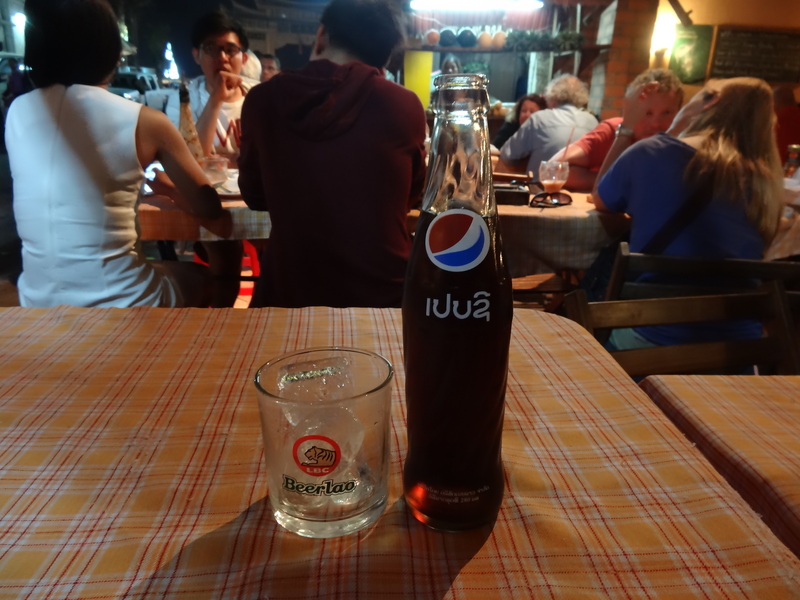 This was my first time going to a real street market in Southeast Asia outside of the tourist-ridden markets in Bangkok and I am thrilled I went. 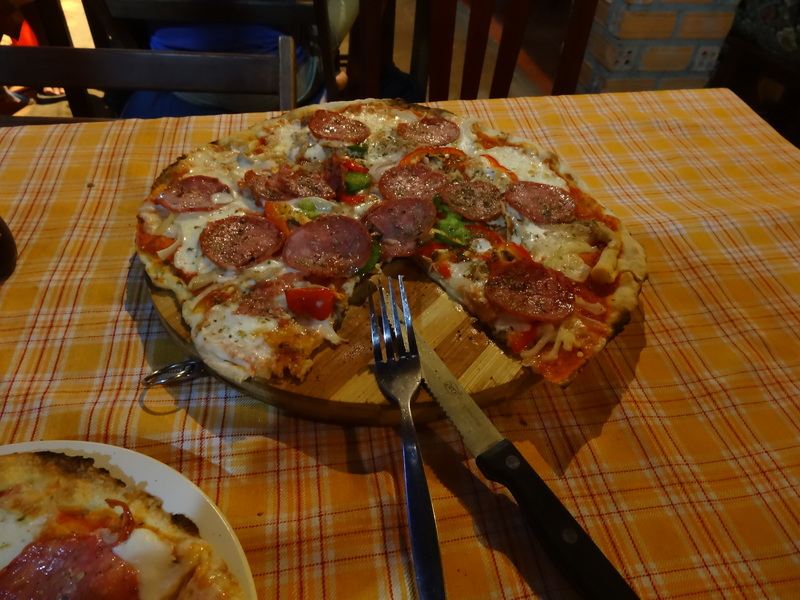 The food was delicious and the company was nice, as well. As the rain picked up and the night wore on, my friend and I split our separate ways and I took a cab back to my hostel where I thought the night was over, but not before I made some more friends on the road. My hostel boasted a rooftop bar so I headed up there to see if any interesting people were still awake. 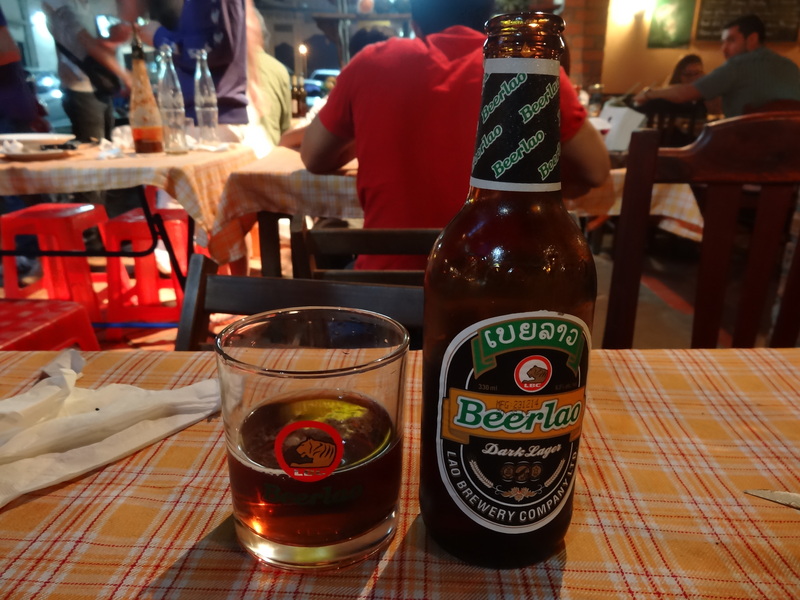 I met a fascinating traveler from London and we had a few drinks discussing our travels, our college experiences, and our current travels before going our separate ways. Early to arrive and late to bed, my first day in Malaysia was phenomenal. 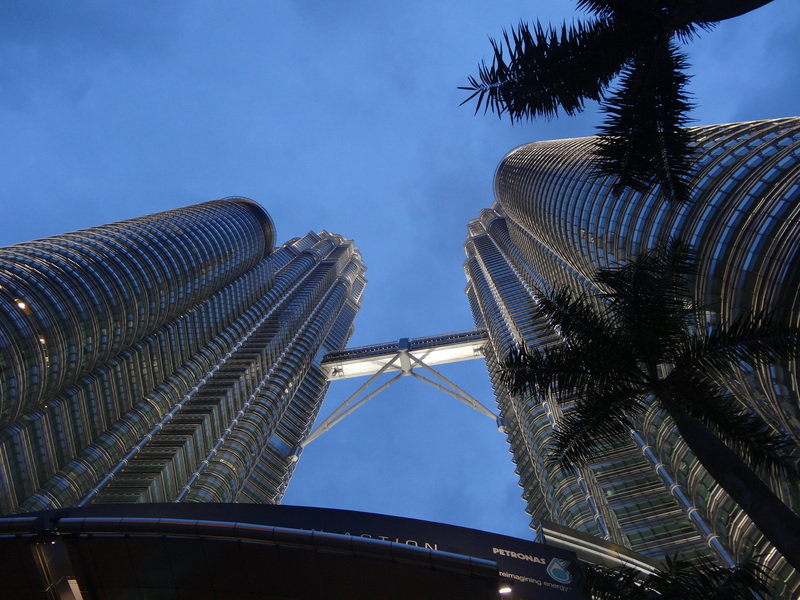 From the historical buildings to the Petronas Towers and the markets in between, I was thrilled to be in KL and could not wait for what the next day had to offer. 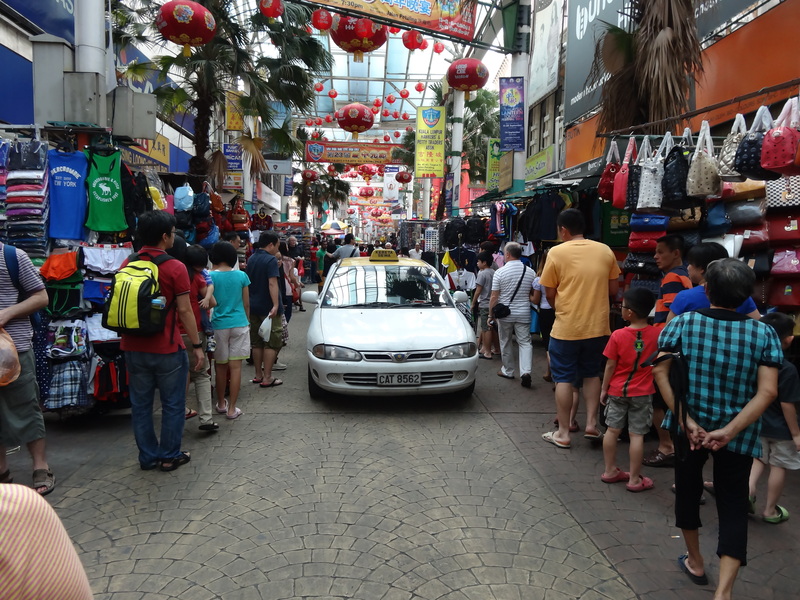 It was a marathon day of meandering through Kuala Lumpur’s narrow streets. Before I travel, I often create expectations and conceptions about how places will be, how the people will be, and how enjoyable a certain location will be. Sometimes I am dissappointed and other times my expectations are completely destroyed as a destination outshines even my highest expectations. I must admit that Hong Kong destroyed all of my expectations and then some. My journey to Hong Kong with one of my close friends (and Macau in its own right) is an adventure I will never forget. Things got off to an interesting start- a start that is only possible in Japan. Because public transportation in Japan shuts down between basically midnight and between five and 5:30AM, it was impossible to make it to the airport in time for checkin and security clearance prior to our 8:30AM departure to Hong Kong. The trip to Kobe would have taken too much time. As a result, my friend and I pulled and all-nighter on the cold, hard, wooden benches of Kansai International Airport Terminal 2. 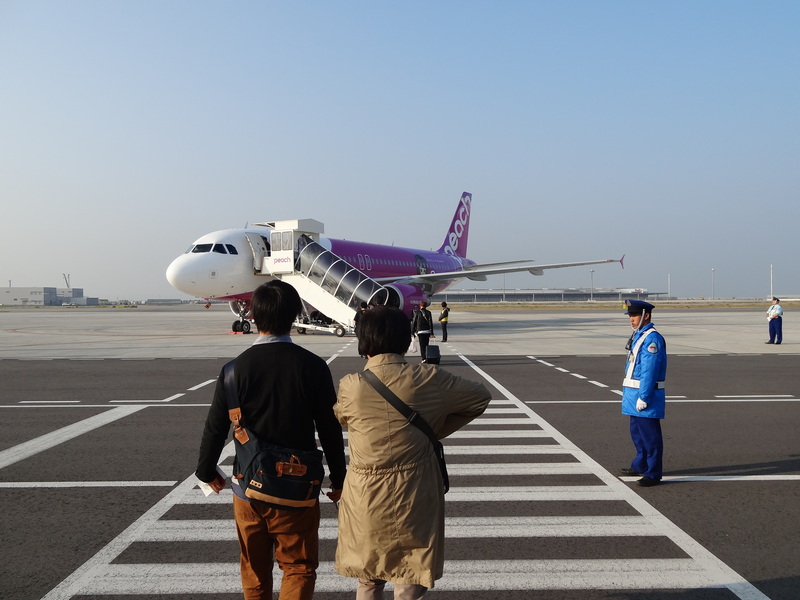 I will undoubtedly have to do this again because of the early nature of some of Japan’s international flights, but this is something to which I do not look forward, even in the slightest. We took advantage of the free rental blankets at the airport, made some new friends who were bound for Korea, and slept as best as we could for about four hours. Once the terminal filled with people bound for Taiwan and South Korea, we were alive, awake, and ready to take on Hong Kong. Following a quick money exchange and an old school walk on the tarmac, we were onboard and ready to start our adventure in Hong Kong. I had to do the obligatory Richard Nixon wave and peace symbol before boarding. Four hours and one long nap later, we touched down in Hong Kong and it was so exhilarating to know I had finally arrived to one of my top travel destinations! Ever since I have been a child, I wanted to visit Hong Kong and I knew I was only a few minutes away from getting the coveted passport stamp to finally verify I had made it to the former British Colony! 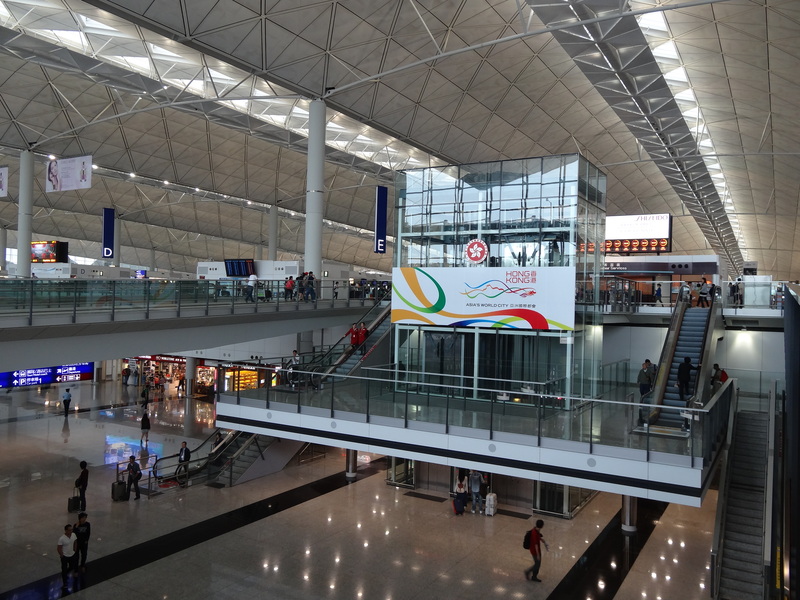 There was one catch- Hong Kong (and Macau) STOPPED issuing passport stamps in July! I was so disappointed when I passed through immigration and a flimsy card stating my permitted length of stay was stapled into my passport. One of my favorite things about travel is getting passport stamps and I was robbed of the Hong Kong stamp! 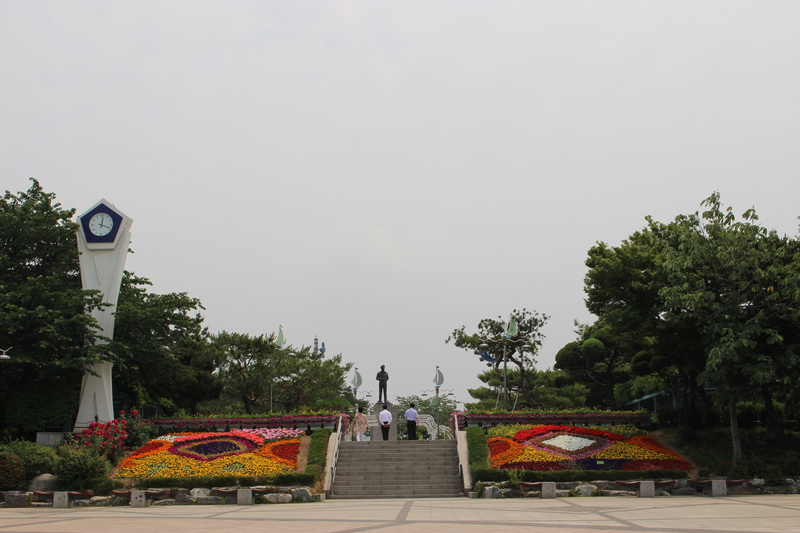 The disappointment quickly faded as we headed towards our first destination of the whirlwind trip: Hong Kong’s famed Big Buddha. 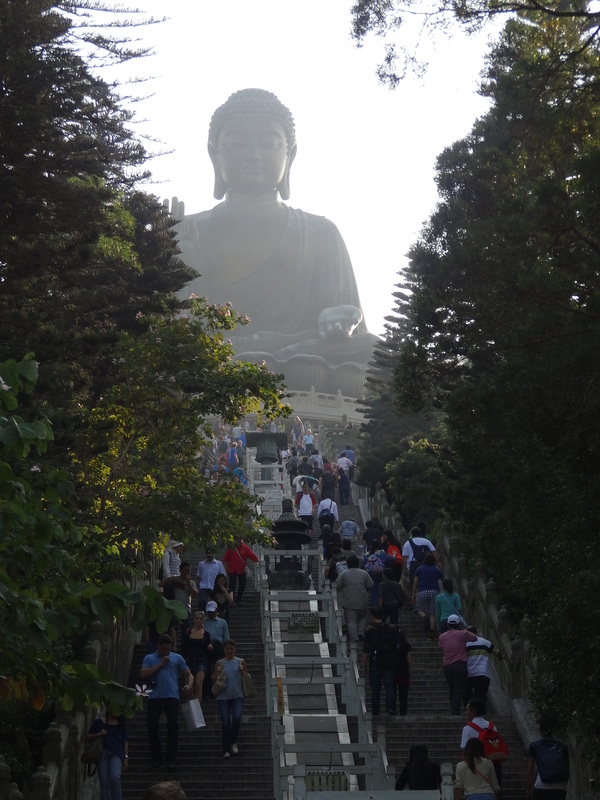 Following a short and remarkably easy ride on Hong Kong’s MTR, my friend and I exited and “minded the gap” as we made our way toward the Big Buddha. After a stellar hour long wait in the serpentining lines, we made our way onto one of the crystal cable cars for the unforgettable ride going through Hong Kong’s rolling hills and lush forested areas en route to the Buddha. If I can make one recommendation here, you MUST pay a few more Hong Kong Dollars and get the crystal carriage cable car for two reasons: First, the line is much shorter than the standard carriage line. Secondly, you can see through the bottom of the carriage and view some winding trails through the mountains, several inlets, and various other cool spots during your ride. The view was amazing. After a trek through a heavily tourist area filled with nick-knacks, trinkets, and fake souvenirs, we had finally arrived at one of the most iconic images of all of Hong Kong: the staircase leading up to the 1996-built big Buddha statue. The view was completely breathtaking when you reach the bottom of this staircase. Unfortunately due to bad lighting with the sun directly behind Buddha, the photo cannot give this scene the justice it truly deserves. 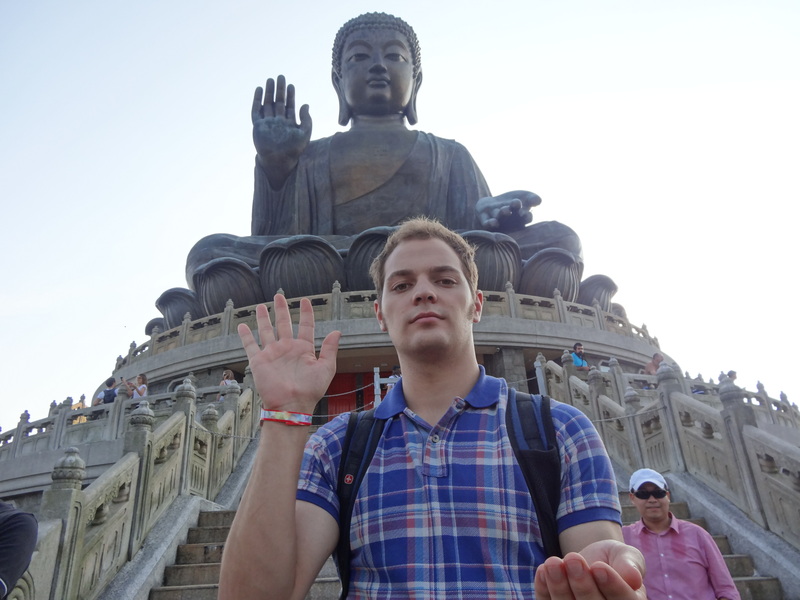 Even though this Buddha was only finished in 1996, the amount of tourists and locals alike at this site was incredible. Buddhists praying, Asian and Western tourists taking photos, and the Korean comedy group outside one of the shops along the route there stuck out the most to me. Of course a trip to this Buddha would not be complete without a photo posing just like the largest sitting Buddha statue in the world. After another breathtaking ride on the cable car (this time at sunset) and checking in at our hotel on Hong Kong Island, my friend and I began our journey to another one of Hong Kong’s must-see attractions: Victoria Peak. I had always heard fables about Hong Kong being the shopping Mecca of East Asia but never truly gave those claims the credence they probably deserved. After having lived in Tokyo for a few months in early 2011 as a study abroad student, I though nowhere in Asia could possibly beat Tokyo when it came to glamorous stores, ritzy stores, or sheer opulence. I was resoundingly incorrect. The walk from our hotel to the famed Victoria Peak Tram took us through a shopping mall which hosted stores like: Marc Jacobs, Burberry, Cartier, Gucci, and other top dollar stores, stores I had never seen before outside of a magazine or New York City. I was in awe at the wealth I had only started to see in Hong Kong. Things got even more interesting when we made our way to the tram. I had never ridden a vehicle on such a steep incline in my whole life. 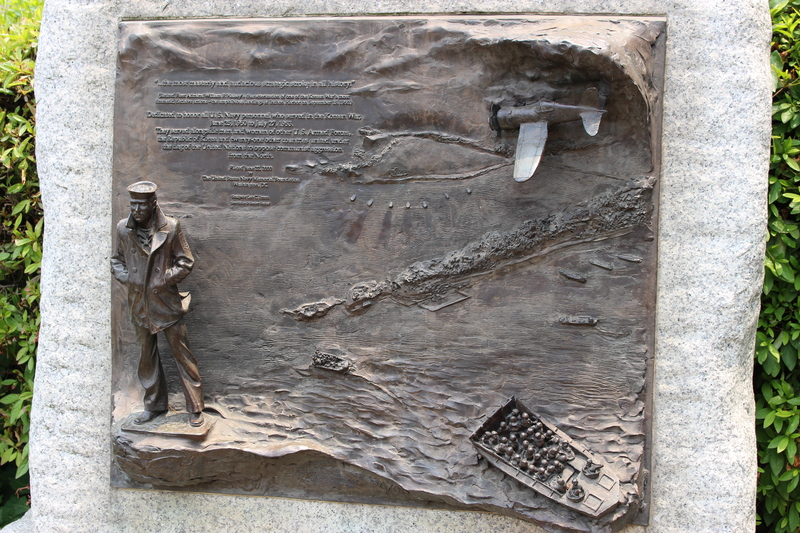 Last summer, I attended language school in Oakland, California, and frequently went to San Francisco for sightseeing, eating Japanese cuisine, and visiting Fisherman’s Wharf. During that time, my friends and I took an obligatory ride on the outside of one of San Francisco’s cable cars. 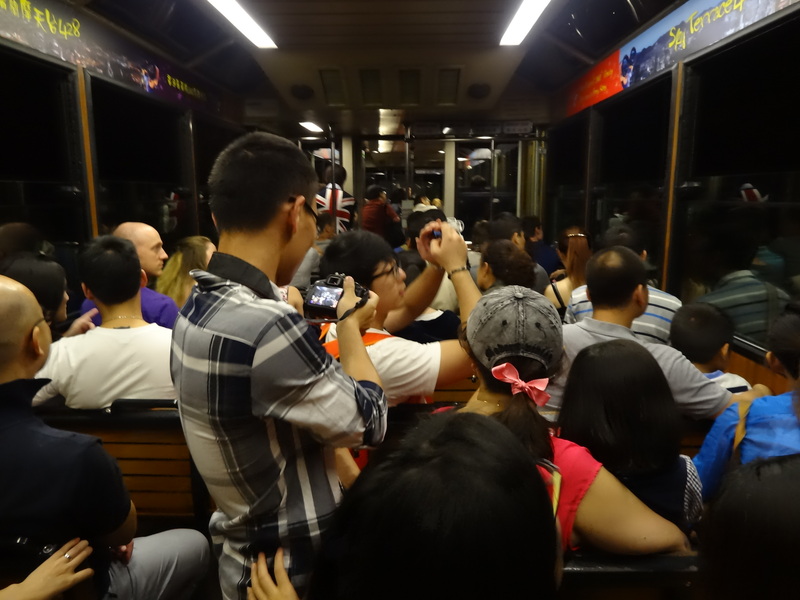 While those streets were steep, the Victoria Peak Tram took steepness to a whole new level. The tram ride felt like it was on more than a 45 degree angle for the entire ride up to the summit. 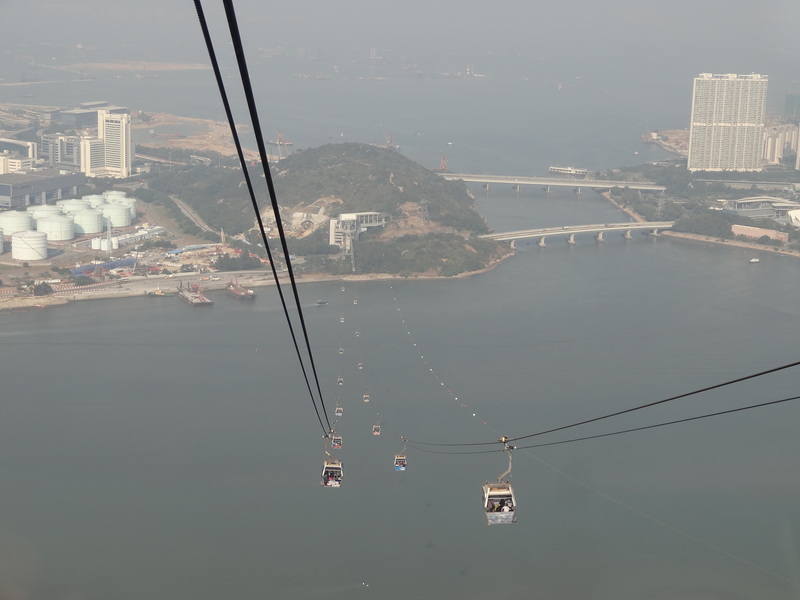 As the car increased speed, the steepness also increased to the point where people were holding on for dear life as they attempted to stand in the cable car. I have added a photo from the inside of the car to give you an idea what this ride resembled. Following this ride, we had finally arrived at Victoria Peak, although a clear view of the city was not yet available from the tram exit. Already only in our first few hours of our four day excursion to Hong Kong and Macau, I felt our trip had met its moment of truth. 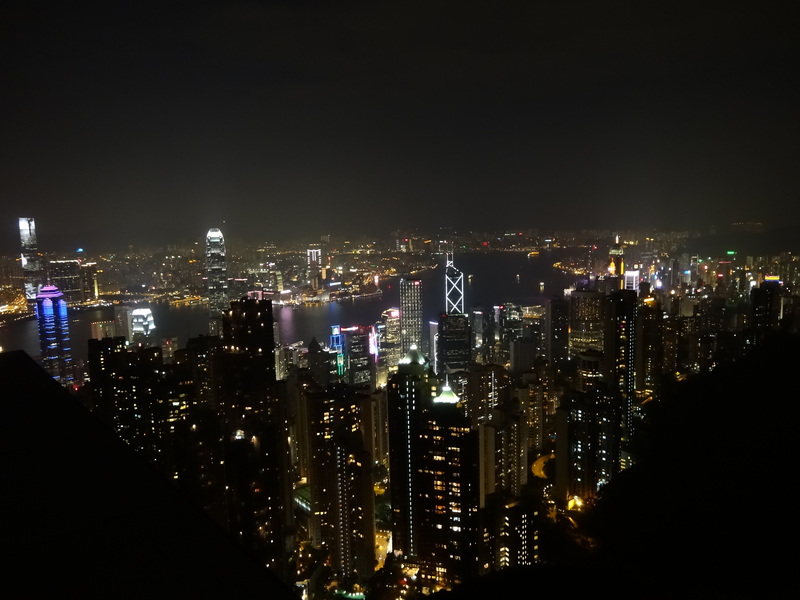 Ever since I saw the first photo of the nighttime view from Victoria Peak, I knew I had to go there. I had pumped up this view to be as good as the Grand Canyon, but in a different way. The lights, the buildings, and the view had to be breathtaking, didn’t they? 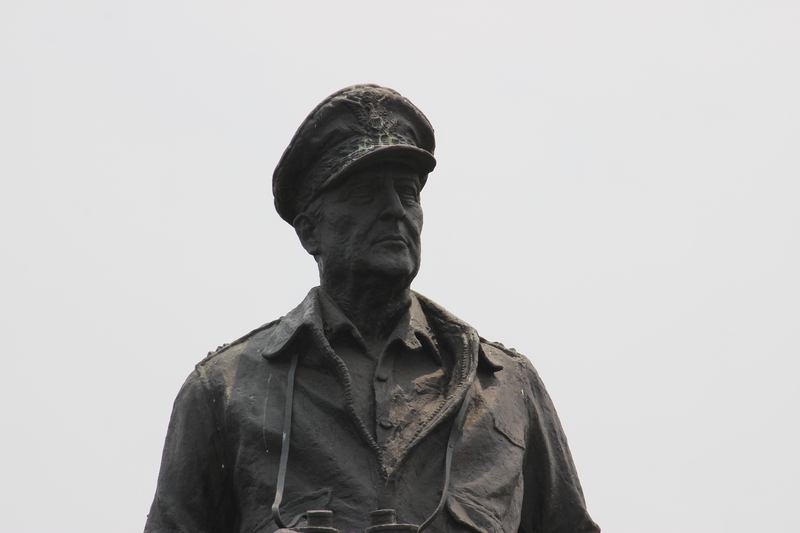 On the ride up to the top, I had noticed that the Bank of China lights were off and I feared for the worst. 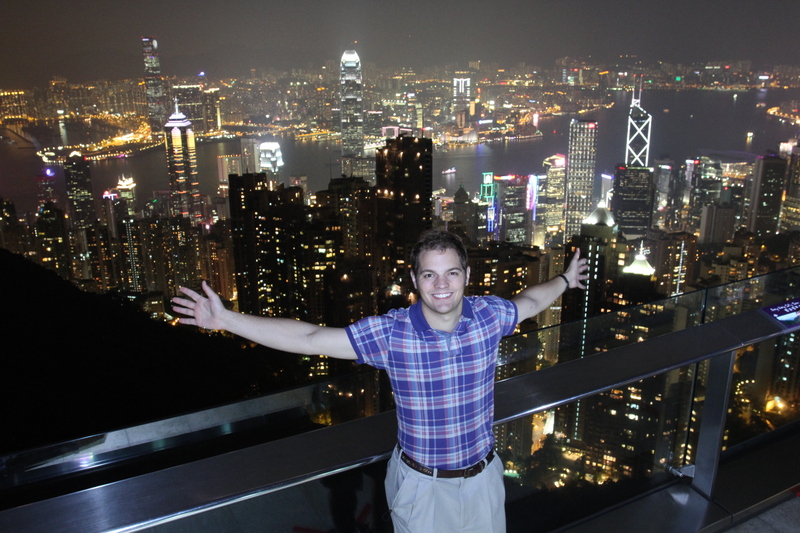 I will let you be the judge of how the view was at Victoria Peak before I write any more. As you can surely see from this photo, reaching the top of Victoria Peak and peering over the handrail was one of the happiest and most rewarding travel moments I had ever experienced. The view there was everything I had imagined, and then some. The glistening skyline off of Victoria Harbor, the twinkling lights in all directions, the cool wind coming across the viewing balcony, the messages on the International Commerce Centre, and the moving lights on the Bank of China Tower combined with some new friends I made (more on that in a later post) to make this a night I will never forget. While this world seemed expansive, I was also reminded that the world is such a small place. A friend of mine from Japan happened to be there at the exact same time with his parents! We said our hellos and continued onward with our evenings. Moments like that are just one more reason why I love to travel. I even went ahead and purchased one of the commemorative photos they had for sale. 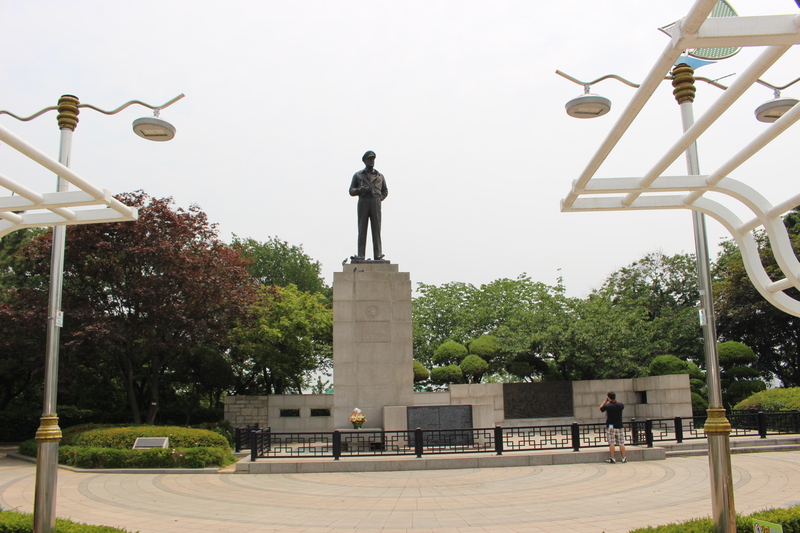 Someday I will proudly hang that in my room alongside my photo atop Roppongi’s Mori Tower in Tokyo. While the next morning called for a 4:45 am wakeup to make our ferry to Hong Kong, that did not seem to matter at all during our first night in Hong Kong. Never in my wildest dreams did I think Hong Kong could live up to the expectations I had built for the better part of 15 years. Happily, the city destroyed all of those expectations on the first night. From the rural and cultural Buddha to the urban and unforgettable Victoria Peak view, I had a feeling that the best of Hong Kong was yet to come. 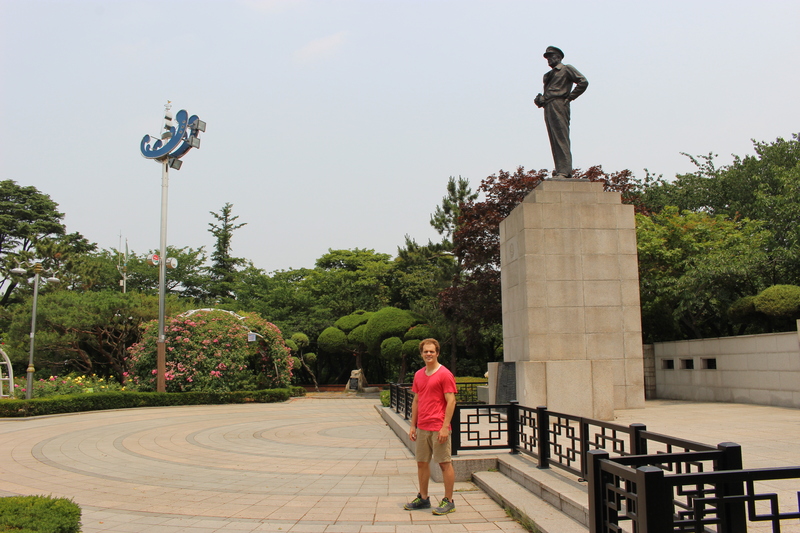 After a long walk back to our hotel, I settled down for a short night’s sleep.